Due to popular demand Pinball Magazine No. 1 has been reprinted and is available now in the Pinball Magazine webshop! The first issue of Pinball Magazine dates back to August of 2012. The magazine sold out in 2014 and since then there has been a growing demand for a reprint. Now the wait is over: it’s here! This reprint has corrected grammer and punctuation, but other than that all articles are the same. A few photos have been added to the Roger Sharpe article, as well as some updated and new advertisements, increasing the total number of pages to 124. As can be seen in the photo taken at the printer today the cover of the reprint is also glossier than the original first print. As with previous publications package deals are available for those who would like to order other issues and/or Santiago Ciuffo’s PINBALL book as well. 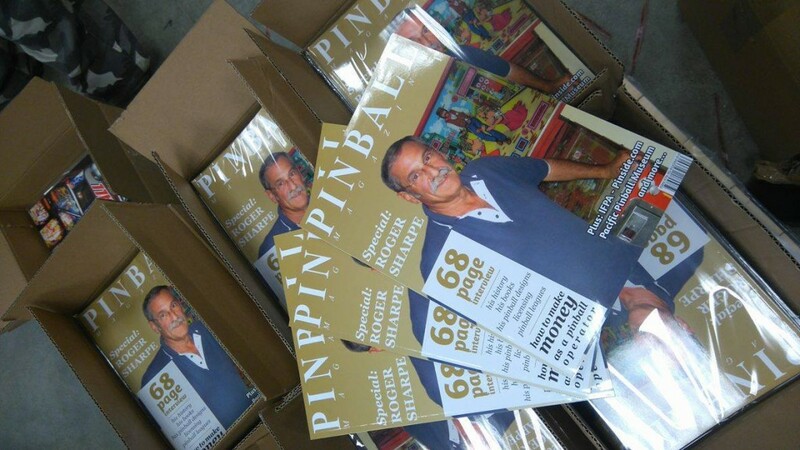 For all (ordering) info please visit the Pinball Magazine webshop. The reprint of Pinball Magazine No. 1 will also be available at Texas Pinball Festival. There will be an extra shipment of orders at the end of this week as well. If you missed out on Pinball Magazine No. 1 earlier, here’s you’re chance to make your collection of Pinball Magazines complete. Order your copy now in the Pinball Magazine webshop.